The Adelphean of Alpha Delta Pi is Alpha Delta Pi’s quarterly magazine featuring news and events of interest to collegiate and alumnae members of Alpha Delta Pi. The Delphi is a quarterly newsletter for alumnae associations and international officers. It encompasses programming ideas for alumnae associations and the latest information on alumnae policies and procedures. The Chronicle is a newsletter updating chapters, international officers, advisors and alumnae associations on new policies and procedures, and other matters discussed by Grand Council. It is emailed weekly on Fridays. Loyally Yours is an electronic newsletter for young alumnae of Alpha Delta Pi published by the Alpha Delta Pi Foundation. Atlanta, Ga. — Alpha Delta Pi Sorority is pleased to announce the women selected to serve as 2019-2020 Leadership Consultants (LCs). LCs spend the academic year supporting Alpha Delta Pi’s 160 active chapters across the United States and Canada. During their time with a chapter, LCs provide support to chapter officers, members, and advisors in the areas of recruitment, membership experience, risk management, team building, chapter planning, and more. About Alpha Delta Pi Founded at Wesleyan Female College in Macon, Ga., on May 15, 1851, Alpha Delta Pi was the first secret society established for college women. Its principles of scholarship, leadership, sisterhood and service guide more than 230,000 women in 160 active collegiate chapters and 154 alumnae associations of Alpha Delta Pi. Alpha Delta Pi sorority is set to launch an organizational rebrand on June 26, 2019. Atlanta, Ga. — Alpha Delta Pi Sorority is set to launch an organizational rebrand on June 26, 2019. Alpha Delta Pi formed a rebrand committee in December of 2017 to research the current Alpha Delta Pi brand’s impression on our membership including the logo, color palette, tagline, and overall visual identity. The organization had a brand refresh in 2015 with the last overall rebrand being in 2001. After hearing that our current brand feels outdated, we moved forward with the rebrand process and selected Rhyme & Reason Design as our vendor. The goal of this rebrand is to match the modern Alpha Delta Pi woman with our values and acknowledge our history as the first secret society for women. We will have a new logo, tagline, color palette, patterns, and branded materials. Beginning June 26, 2019 at our 167th Grand Convention, Alpha Delta Pi will retire the old brand and unveil the new brand. We look forward to working with our constituents on implementing this brand immediately following the unveiling. Atlanta, Ga. — Alpha Delta Pi Sorority is proud to announce Amanda Sloan as Executive Director effective January 1, 2019. Amanda, an initiate of Alpha Delta Pi’s Alpha Beta chapter at the University of Iowa, brings to the position a wealth of nonprofit and Alpha Delta Pi experience, including tenures both as an Alpha Delta Pi Executive Office staff member and as a volunteer. Amanda worked for five years as the Campus Services Manager at Alpha Delta Pi’s Executive Office following two years as a Leadership Consultant and subsequently served as a leader in volunteer roles as an Expansion Director, Collegiate Province Director, District Team Director, and International Vice President of Collegiate Membership. Amanda currently works as Director of Alumni Engagement for Northwestern University’s Alumni Association where she leads a team responsible for alumni club engagement and program development. She holds a Bachelor of Arts from the University of Iowa and a Masters of Public Administration in Nonprofit Management from Georgia State University. Outside of Alpha Delta Pi, Amanda serves on the executive committee of the Association of Fraternity/Sorority Advisors Foundation and enjoys being an aunt to her niece and nephew. Amanda will relocate to Atlanta, Georgia. Jennifer (Jen) Smith Dickinson, Delta Alpha Chapter – Emory University, continues to serve as our Interim Executive Director (IED) through December 31, 2018. Jen has provided invaluable leadership to Alpha Delta Pi, serving as a visionary leader for our Executive Office team and creating a culture of excellence and accountability. We are immensely thankful for her service and leadership as our IED this year. Founded at Wesleyan Female College in Macon, Ga., on May 15, 1851, Alpha Delta Pi was the first secret society established for college women. 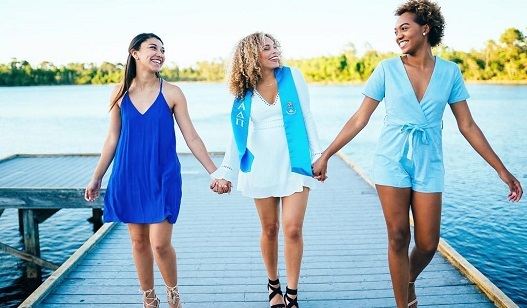 Its principles of scholarship, leadership, sisterhood and service guide more than 230,000 women in 160 active collegiate chapters and over 154 alumnae associations of Alpha Delta Pi. The Delta Delta House Corporation Annual Meeting is Thursday, April 25 at 6:30 pm at the chapter house. The Alpha Omicron House Corporation Annual Meeting is Saturday, April 27 from 1:30 to 2 pm. There will be an open house and reception following. Please RSVP to Holly Hesser at hollyhesser@yahoo.com.